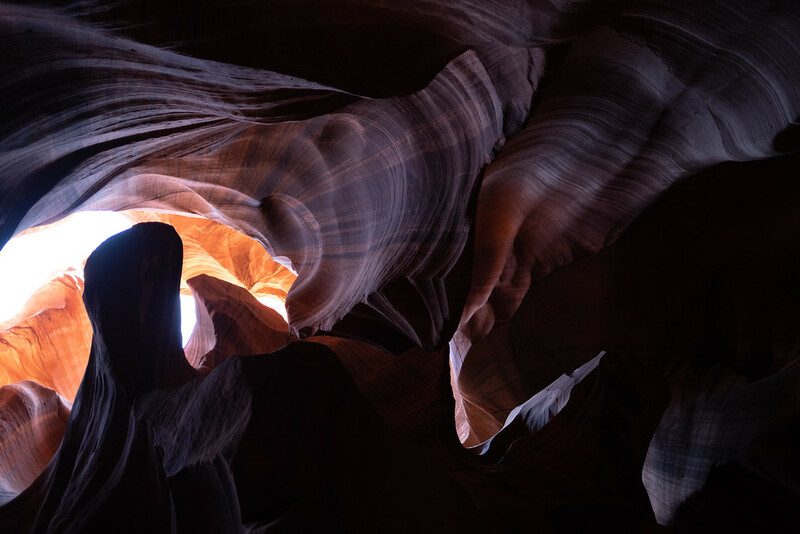 Antelope Canyon is located on the Navajo Nation immediately east of Page Arizona. Page the old work camp for the Glen Dam an as such is an independent island of land cut out of the Navajo Nation. It is nestled next to the Glen Canyon and the massive reservoir created by the Glen Dam. Antelope Canyon itself is just outside of Page. There is an upper (Tsé bighánílíní place where water runs through rock) and lower canyon (Hazdistazí) on either side of highway 98 with parking lots that require an entry fee. The upper canyon is accessed by vehicles carrying groups of people along a long wash until you get to the slot canyon opening. 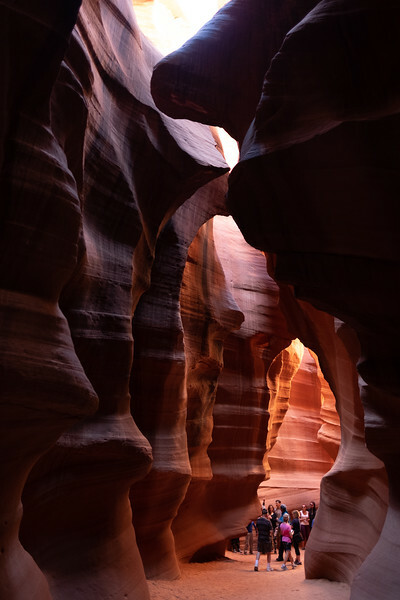 The lower canyon reveals itself only all a crack across the desert and is accessed by a metal stair case system that takes you down into the canyon. The canyons are eroded sandstone created through a combination of flash floods and other subaerial processes. The colours in the canyon red, magenta, gold, orange, pink and vermillion vary depending on the light and time of day. Both canyons are prone, like all canyons in desert washes, to large flash floods that fill up the slot canyons without warning. Flash floods the second most deadly weather hazard, are particularly dangerous in a slot canyon. After 11 tourists were killed in these canyons in 1997 by a rain storm that occurred 11 km upstream, an alarm horn has been installed at the top of the canyon directly connected to NOAA. All access to these canyons must be done through the Navajo Nation using authorized guides.